Except for the brass end strips, the prototype of my big 3-D Crystal Dragon jewelry cuff is almost finished. For two years, I have been working out the details. 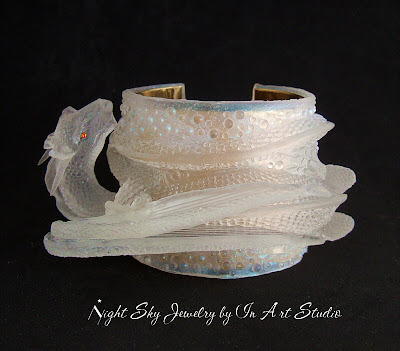 I am so excited to see my crystal dragon cuff design come together! I decided to order a quart of a new, super expensive, super clear rubber urethane. I am still running tests, but, so far, so good. What a steep learning curve there is with this new resin. The temperature has to be just right, the pressure has to be 60 psi minimum, the wind has to be out of the east, etc. The cure time is 16 hours under pressure, then another 6-8 hours at room temp, then into the heat box for another 16 hours at 160 degree F. That is a long time to wait, until you can de-mold, and see if your casting was successful. The clarity of this new resin is amazing. 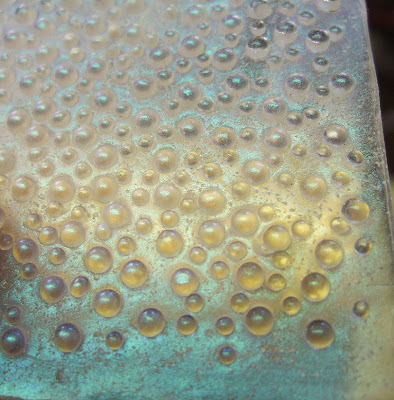 Compared to optical glass, which has an index of refraction of 1.50, this new resin has an refractive index of 1.488. That is pretty close to crystal clear. I am loving how this new resin looks. Here is a test sample shown against the brass cuff. The brass backing will allow this dragon jewelry cuff bracelet to be infinitely adjustable.